The need for providing an adequate channel for Frankford Creek has been recognized for more than 60 years. Channel lines for the creek were established and confirmed upon the City plan as far back as 1885. Records show that these early lines were revised seven times in the period 1885 to 1902. Subsequent to 1902 attention appears to have been centered on the navigable portions between the mouth and Margaret Street. Surveys leading to dredging operations were made by the Department of Wharves, Docks and Ferries ten times in the period 1915-29.
the City to recover damages from frequent flooding. The City's engineers made studies of the floods and the extraordinary storms causing them and these studies were presented as expert testimony in the court sessions in September 1932 and June 1933. 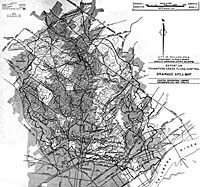 The current phase of the flood investigations on Frankford Creek stems from an Ordinance of Council approved August 9, 1944, the purpose of which was to authorize a revision of the City Plan so as to establish thereon a right-of-way for the channelization of Frankford Creek as a measure of flood control.... One of the provisions of this ordinance directed the Department of Public Works and the City Solicitor's Office to make a joint report on the project. The report was prepared and submitted to the City Council under date of February 8, 1945. This report gave a brief description of physical conditions along the creek, stressed legal problems involved in obtained rights-of-way and made brief engineering recommendations. Reports by the War Department. A preliminary examination and survey relative to the improvement of Frankford Creek for navigation was authorized by the River and Harbor Act of March 3, 1881. A favorable report was submitted by the War Department on January 25, 1882. This report, which was included in the Annual Report of the Chief of Engineers for 1882, recommended improvement for navigation from the mouth of the creek to Frankford Avenue at an estimated cost of $40,000. The project was adopted by the River and Harbor Act of August 2, 1882, and the sum of $10,000 was appropriated for a portion of the work. In 1884 the Chief of Engineers reported that Frankford Creek was being regulated by the City of Philadelphia. and recommended that no further appropriation be made by the Federal Government. [page 7] The River and Harbor Act of August 17, 1894, provided the sum of $2,000 for straightening Frankford Creek in the vicinity of Aramingo Avenue. The District Engineer for the War Department reported that the proposed work had never been considered and was not justified by the prospective commerce. The work was never carried out by the Federal Government but was later undertaken by private interests. A preliminary examination and survey was authorized by the River and Harbor Act of June 25, 1910. Pursuant to the authorization a report was submitted by the Chief of Engineers on November 7, 1912, and printed in 1913 as House Document No. 1260, 62nd Congress, 3d Session. It is interesting to note that this report found the actual and prospective commerce on the creek sufficient to justify improvement for navigation but that the Federal Government was not justified in undertaking the work because the benefits accrued only to the industries of Philadelphia. The Committee on Rivers and Harbors of the House of Representatives directed on January 29, 1934, a review of the unfavorable report of 1913. The Chief of Engineers submitted a report on December 24, 1934, which was also unfavorable as regards improvements for navigation. The final report by the War Department was authorized by Section 6 of the Flood Control Act approved June 28, 1938. 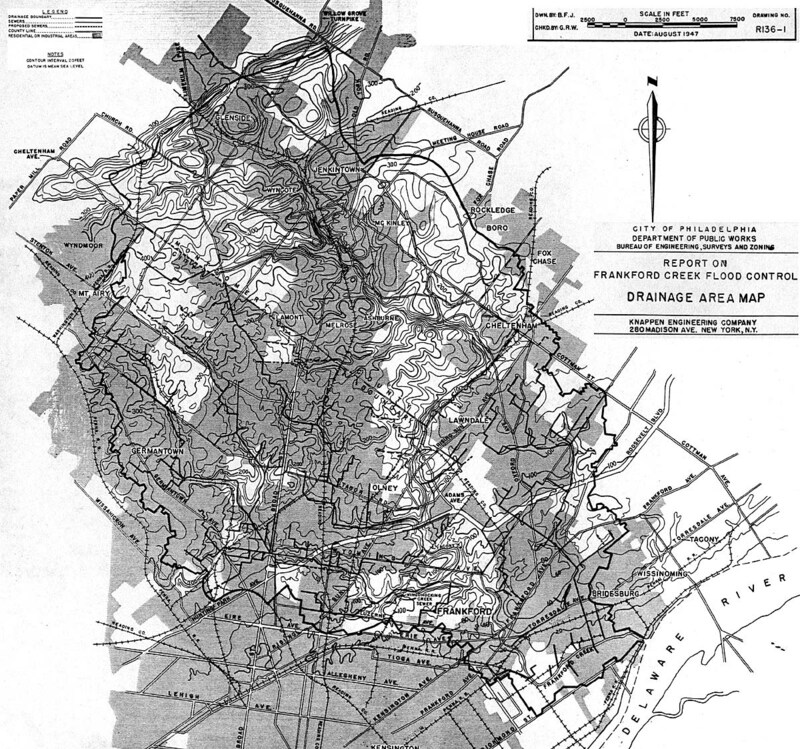 This report, which was dated February 15, 1939, was a preliminary examination of flood conditions on that portion of the Frankford Creek watershed located in Philadelphia County. The conclusions of the report were that improvement for flood control or for flood control in conjunction with navigation was not economically justified. It should be emphasized that the authority for this survey only required comparison of past flood damages and probable future flood control and navigation benefits, and did not permit consideration of civic benefits to be [page 8] obtained from the reconstruction of obsolete bridges, from the correction of obnoxious and unsightly conditions, from the large potential increase in land and property valuations resulting from flood protection, and of the need for an adequate outlet for storm drainage. The last action by Congress affecting Frankford Creek was taken on June 11, 1940, when an act was passed declaring the creek to be non-navigable within the meaning of the Constitution and laws of the United States. By that time the creek was non-navigable in fact due to filling in of the channel.